Traces of explosive have been found on the wreckage of South Korean warship destroyed in a mystery blast in March and are similar to the type used in torpedos, a report said Friday. Four metal fragments which have also been found are an alloy of aluminum and magnesium used in a torpedo's casing, Yonhap news agency quoted an unidentified government official as saying. The report, if confirmed, would further strengthen suspicions that a North Korean torpedo blew the corvette apart near the disputed border on March 26 with the loss of 46 lives. The defence ministry denied the report, as it did a similar report on Thursday. A multinational investigation team has been analysing wreckage and fragments "but no conclusion has yet been made", spokesman Won Tae-Jae said. 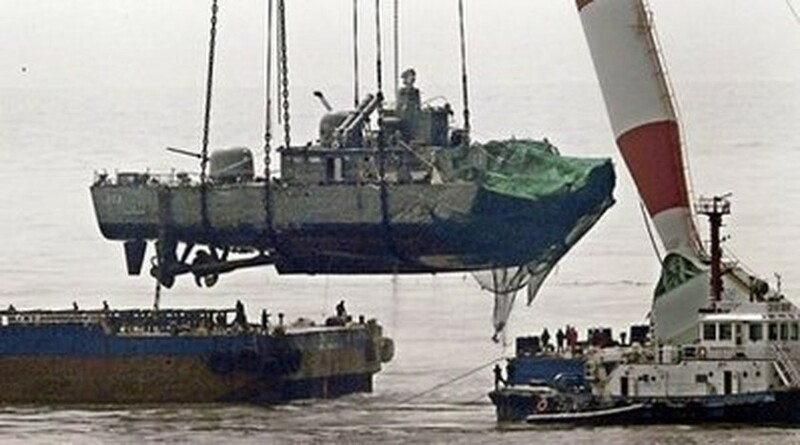 A giant floating crane lifts the stern of sunken South Korean warship PCC-772 Cheonan near the disputed Yellow Sea border. Investigators have said a powerful external blast tore the 1,200-tonne ship in two -- apparently limiting the possible causes to a torpedo or a mine. The explosive traces were found to be of a high explosive called RDX, which is used in torpedoes but not mines, Yonhap quoted the official as saying on condition of anonymity. Experts from the United States, Sweden, Australia and Britain have joined the investigation to ensure it is transparent. After it ends, probably this month, Won said South Korea could invite experts from China and Russia -- countries close to North Korea -- to inspect the ship's wreckage. President Lee Myung-Bak hinted Tuesday that North Korea was involved in the sinking. He promised a "resolute" response when the cause is established following the probe. The South has not publicly ruled out a military response if the North is proved to have sunk the Cheonan, but has said it would probably take the issue to the UN Security Council. As a veto-wielding Council member, China's support would be crucial in anmy attempt to punish its ally. Lee said results of the probe would be discussed with China. North Korea has denied responsibility for the sinking. The area where the Cheonan went down was the scene of deadly naval clashes in 1999 and 2002 and of a firefight last November which left a North Korean patrol boat in flames. South Korean and US officials have said efforts to restart six-party talks on the North's nuclear disarmament should be put on hold till the warship investigation is complete.